When it first appeared in 1986, James McClendon's Ethics laid claim to two compelling theological ideas. First, that a highly distinctive theological perspective characterizes the inheritors of the sixteenth century's radical reformation. At the heart of this perspective is what McClendon calls the baptist vision, a way of understanding the gospel that emphasizes the church's distinction from the world, and its continuity with the church of the New Testament. 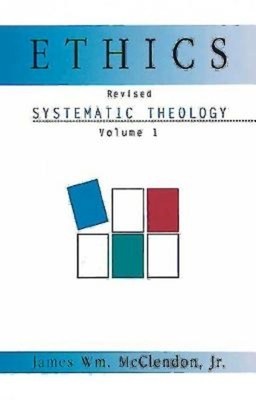 Second, that because of its emphasis on the centrality of discipleship, this radical-reformation outlook insists that theology's first task is to discover and explore the shape of the church's common life as the body of Christ; hence McClendon's novel decision to begin the task of writing a systematic theology with a volume on ethics. Since its first publication, Ethics has been followed by Doctrine (1994) and Witness (2000). The completion of the overall work has brought into sharper focus many of the theological and ethical issues and concerns central to the baptist tradition. In this revised edition of Ethics, McClendon infuses his claim for the priority of ethics within the theological task with a new urgency, born of the fuller, more complete definition of the baptist vision that Doctrine and Witness have made possible. Ethics is central, he reminds us, because biblical faith rests on a set of distinctive practices that arise from our placement within a larger Christian story. In his revisions McClendon offers a more complete explanation of how the interaction of faithful practices and gospel story give rise to a way of life that is distinctively Christian.